I know my own kids have answered that way too. But it’s not that they aren’t interested. They’re just busy trying to get through life the same as us, as unscathed as possible, hoping to look cool to their peers, and figuring things out as they go along. And besides, just like us, they’re preoccupied their own problems. I’m not sure anybody can really answer the question “Who am I?” It’s too broad. It covers all sorts of things––physical attributes, social abilities, and spiritual and psychological beliefs that are, in many ways, constantly evolving. Now as for the question “Why am I here?” that’s deeper but easier to answer. I think it can be answered by looking both outside yourself and inside yourself. Outside of yourself you see others’ needs. Inside yourself you see your abilities and interests and have a desire to meet those needs. You feel you’ve fulfilled your mission in life if you can discover how to happily fulfill the needs and desires of others. The Scripture says all things were created for HIS pleasure. It may seem illogical, but putting a smile on his face is a pretty fulfilling thing to do. And why not? He’s the one in whom we live and move and have our being. I’m 67 years old. Every day I think about how I’m running out of time. Sure, I know it sounds pretty depressing. But it isn’t really. It makes me focus on what’s meaningful. And more importantly, it makes me want to accomplish what I’m here to accomplish. Whether we do business together or whether you just want to know more about me, I think the best thing I can do for you right now is to transfer to you whatever truths I’ve learned in this life. The truth has served me, and I’m sure knowing the truth will be of benefit to you too. The funny thing about the truth is that when you find it, you can’t go back and “unfind” it. And you can’t forget about it either. It makes you want to tell others because there’s freedom and advantage in knowing the truth. You see the big picture, and the more you learn the more you connect the dots. You’re no longer frightened of what you don’t know. When danger appears, you recognize it. It changes you profoundly. It changes your worldview, it changes your actions, and it changes your value system. It did for me. I think my mission is to relay to you what I’ve discovered about three important areas concerning us all––Life, Death, and Truth. I’ve written two books and am working on a third that deal with these important topics. The first book deals with Life, Death, and Life after Death. As it turns out, lots of people are. Maybe it’s because they’re not sure what happens after they die. Dying can be a scary thing. Many people live their whole lives with a nagging fear that they’re going to die. In fact, there is no escaping it. We all know it’s coming. When you’re dead you’re dead. And some people act like that’s what they believe. And some really believe it’s true. Others believe in an afterlife. Even people without any formal religion believe this. All the religions of the world have a view on eternity and what you must DO to get it. 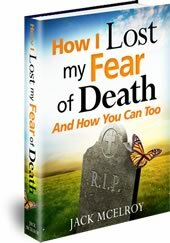 How I Lost My Fear of Death and How You Can Too covers my personal search for the answer to this question. ble” for you: Christianity, Judaism, Buddhism, Hinduism, Islam, Humanism, and Atheism. It also covers major Christian sects––Catholicism, Eastern Orthodoxy, Protestantism, Jehovah’s Witnessism, and Mormonism. Each is briefly consulted on what it says about life after death and how to get it. Next, the Holy Bible is examined on what it says about life after death. The information may shock you. But in the end, you will find a way to lose your fear of death once and for all. If you’re interested, you can learn more here. The Bible is the most loved, hated, reverenced, and ridiculed book on earth. The “Good Book” is so precious to some folks that they’ve sacrificed their lives to translate, print, distribute, and even just own it. Others have spent their lives trying to prove that it’s nothing more than a book of myth and superstition. It is truly a remarkable book. It’s been banned by many governments over the centuries, so its contents must be a threat to someone’s state-sponsored religion. But there’s a problem. There are many versions that say and mean different things. Sometimes the differences are so significant they make the Lord out to be a liar or look just plain foolish by saying contradictory things. If the Bible is our only authority for what we believe, and if there are problems with the Bible, then our whole foundation is weak at best or nonexistent at worst. 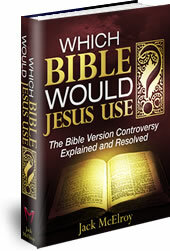 I wrote Which Bible Would Jesus Use?––The Bible Version Controversy Explained and Resolved to clear up this problem once and for all. I prove that if the Lord Jesus Christ came to your church, he’d use the same version he has been using for the past 400 years––the King James Bible. Take a personally guided tour of my website. I want to give you a feel for who I am by sharing my background on the rest of this site. Although you’ll read about different businesses that I’ve been involved in, what they are to me is a series of interesting projects and life experiences. Most of this site is written just as if we were speaking in person, so that I can personally guide you through the various areas. I hope you find it an interesting and enjoyable read. I suggest you start here.